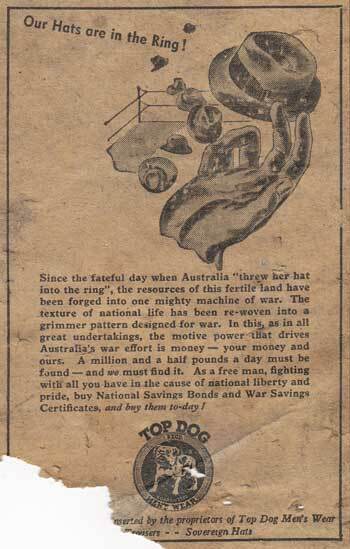 Top Dog Men’s Wear advertisement promoting National Savings Bonds and War Savings Certificates. Published in Smith’s Weekly 26 June 1943. This advertisement comes from fragments of Smith's Weekly found in the roof space of "High Beach". I used to wear pale blue Top Dog shirts to school as part of my uniform while attending Mary’s Mount , Gooseberry Hill in the early 1950’s. "Top Dog" was a brand name of the delisted company Sargood Gardiner Limited. They had their production centre in Dee Why (Deewhy) in New South Wales.